I’m convinced that there is a reason that we all — in the blogosphere — seem to find ourselves writing posts on the ideal pamper on a frequent basis, in a way that veers towards the obsessive and that said reason is not a lack of originality; there’s something about the power of a pamper, that makes our hectic daily lives a little more relaxed and manageable, I reckon. I have far too much on my growing agenda to abondon in the aim of merely giving myself a little bit of indulgence, however, so I find myself loving the routine of a scaled-down pamper with some productivity thrown in. Now, I’m not necessarily one to look towards for organization inspiration, though. I’m just overcoming my previous status as organizationally impaired. One. Break down and the list into smaller achievable tasks and write it down. This seems so obvious but it’s not so simple and easily dismissible as it seems. I can’t even tell you how many times I rolled my eyes when authority figures preached this at me in my earlier school years and while they presented it in the most irritating patronizing manner, they were right in a sense. It’s much easier to get things done when you actually identify what realistically can be accomplished in the time quota and the smaller individual parts that the tasks require. I’m aware of how difficult it can be at first to actually look at what has to get done without making yourself instantly nauseous or panicked. Two. Gather your tools and edit out the rest. I’m not someone who has a naturally organized disposition so this was not something that I believed in, in the past but a clutter-free space actually appears to make a difference. I do have to make the effort, forcing myself to get up and choose the necessary items for the whole ordeal and then clean out all of the extras without becoming distracted within he process. It’s not particularly fun — at all — but the tidy-up is a worthy step nonetheless. I’ll get out the books that I have readings that I must get through, my notes if I’m working on some sort of assignment and perhaps my blogging notebook, for example. Three. Set up the pamper-y atmosphere. With the previous step down, this one should be a breeze. The whole pampering experience seems to me to be synonymous with the zen-like state and ease that lounging with your feet in the bath, whilst wearing the most luxurious bathrobe and while I wouldn’t go that far on a typical Sunday not-funday, I try to emulate the spa-like experience. I would go for some of the most comfortable and cozy glorified sweatpants-and-a-hoodie combo, embrace the cliche and light a scented candle, with a magazine and cozy blanket within sight. Four. Work a face mask into the routine and add full-on body cream slather into the mix. Obviously, the pamper requires pamper products and with productivity in mind, it only makes sense to go for a duo (or trio) of products that bring on that pampered feeling with minimal time and effort while making the whole task of getting stuff done a little bit more enticing. So, I normally would go for a mask but I didn’t because my skin is like the sahara desert at the moment — but I normally would. Instead, I went for the fruit-acid containing Indeed Laboratories Facial Powdered Exfoliator ($30) that once mixed with water forms a milky foam that instantly brightens and perks up the skin without adding to the dryness situation or further irritating the skin. Unless you have such irritated skin that body moisturization is a necessity or you are obsessed with the whole experience, you likely aren’t someone who religiously finds themsleves slathering on the lotion twice daily but just going for this indulgent experience can be a breath of fresh air, while being bundled in the most cozy blanket, of course. 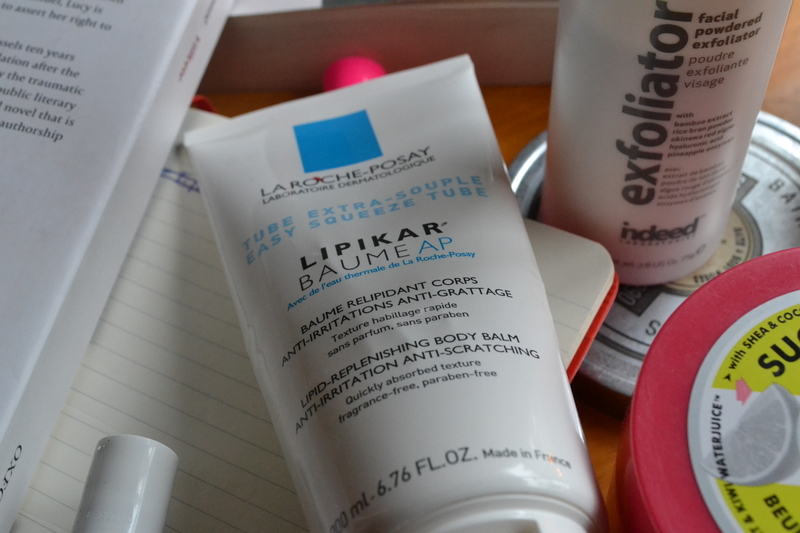 I use a separate cream on my lower legs on account of my irritated eczema there and this cream is the lovely La Roche-Posay Lipikar Baume AP ($30) . 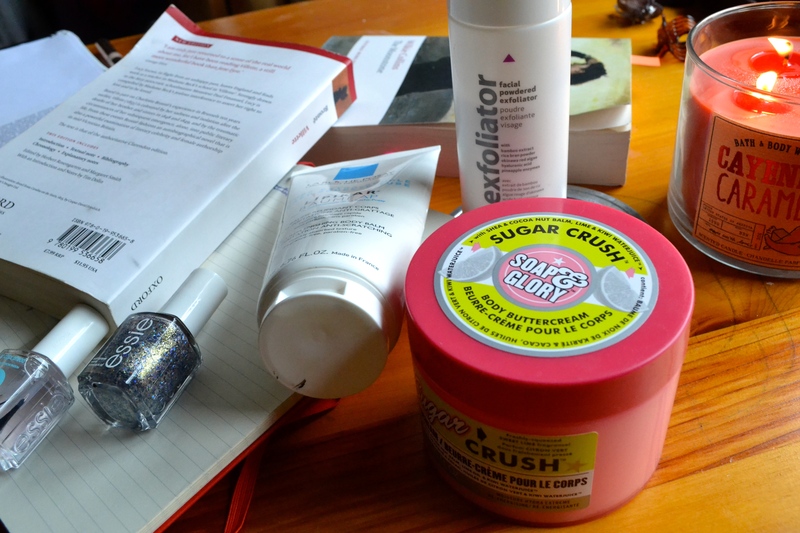 For the rest of my body, I’ll go for my new Soap & Glory Sugar Crush Body Buttercream ($20) that I adore because it smells like the most appealing zesty margarita and has the most luxurious creamy texture. Five. 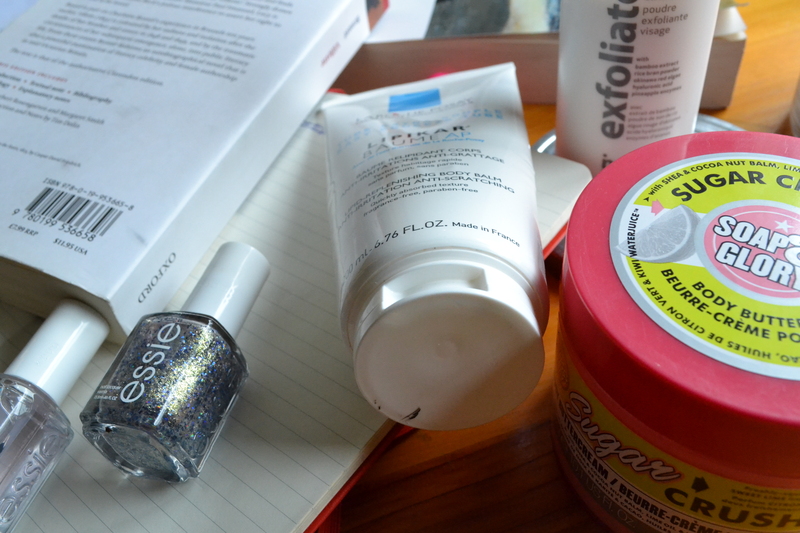 Tidy up the nails and whatever that entails. 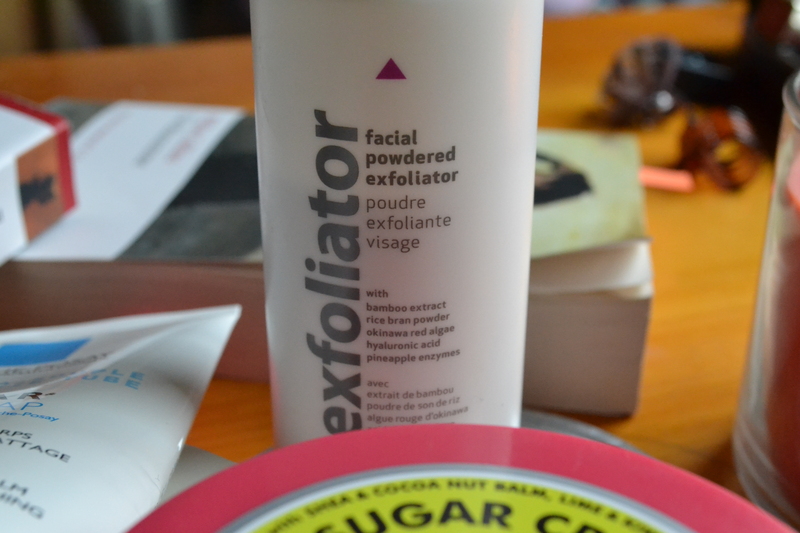 I’ve always wanted to try a powder exfoliator, I hear the dermalogica one is amazing too!